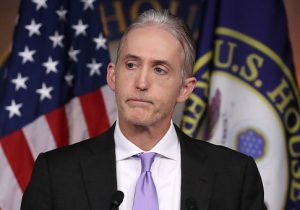 Rep. Trey Gowdy (R., S.C.) on Wednesday said government surveillance programs would not receive the necessary congressional reauthorization for them to continue at the end of the year unless officials answer questions on who in the intelligence community unmasked certain individuals. Gowdy had asked former CIA Director John Brennan about the unmasking process during Tuesday's House Intelligence Committee hearing, Fox News reports. The unmasking process involves revealing the identities of Americans who were collected in communications with foreigners that are monitored by the United States Government. Fox News host Bill Hemmer on Wednesday asked Gowdy about the issue. "We're not going to reauthorize these surveillance programs if the American people are not satisfied that their security is going to be safeguarded," Gowdy told Hemmer. "The unmasking within the intelligence community, that is a privilege to be able to request that a U.S. person's name be unmasked and I want to know who's making the request, what is the evidentiary basis of that request," Gowdy continued. Gowdy also said that requests made late in an official's tenure should be alarming as well. Susan Rice has been accused of unmasking President Donald Trump's associates while she was former President Barack Obama's national security advisor.